Outside of the main content—usually, what site maintainers understand as a "page", or "event", or "blogpost"—lies what we might call the livery: the branding, logos, persistent navigation and elements common to large proportions of any website. A key aspect of content management systems is that they work to keep a coherent design of this livery across the entire website: as much as they possibly can. This means using standard templates (which we'll look at later) to determine a lot of the HTML markup, and only permitting certain areas within that markup to change. 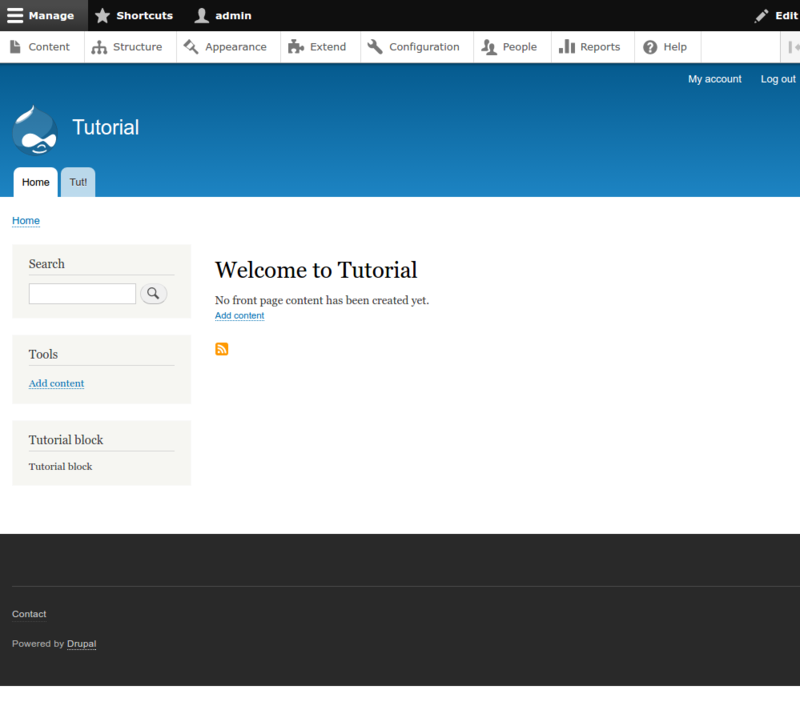 Each block can contain e.g: a chunk of a menu (potentially long menu hierarchies); widgets to subscribe to a post or a newsletter; even custom content editable within the Drupal admin interface. 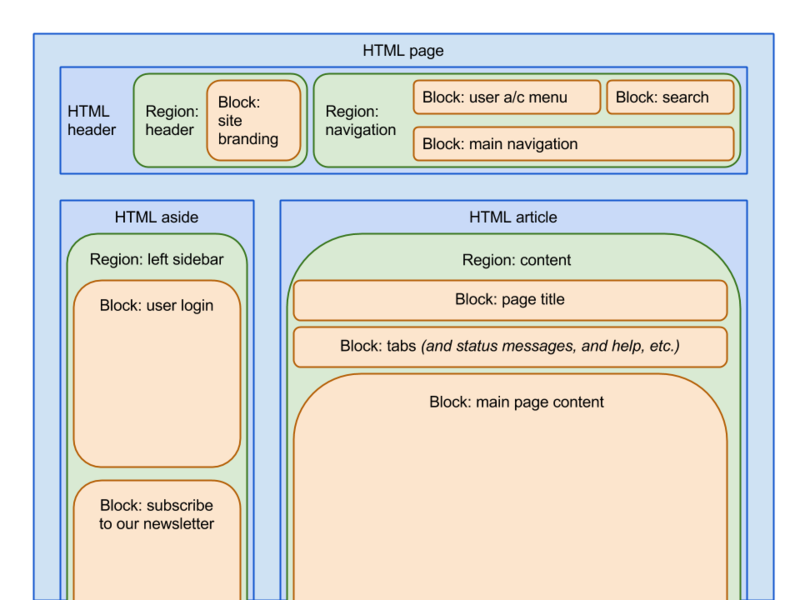 The editable content of a node is itself inserted as a block of a special type: typically you'll want to leave this untouched, in the main content column; but, by turning that into a block too, Drupal 7 and now 8 are able to make all chunks of content behave and relate to each other in the same way, improving maintainability and consistency. 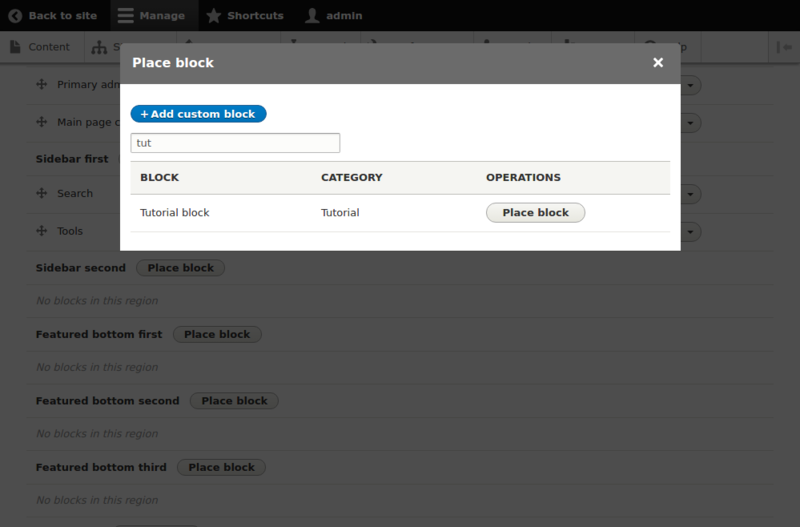 Custom blocks live in modules, so you should know already how to create a module in Drupal 8. They're provided by a PHP class which extends a particular subtype of plugins (more on them later.) That means that, if you create a file in the src/Plugin/Block/ subfolder of your module, and if both the class and file have the right naming conventions (as discussed previously), and also methods and comment formatting (more important than you think: see below), then the block your code describes will appear in Drupal's block/region admin UI automatically, with no extra effort. * Block for the tutorial. * From BlockPluginInterface via BlockBase. Extend the core BlockBase class, using inheritance so that our new class "looks right" to Drupal, and must provide the relevant methods. Implement the BlockPluginInterface#build() method, which is the one "relevant method" that BlockBase leaves up to us entirely. Format the class comment to use annotations like @Block. As previously seen during discussions about routing the build() method returns a "render(able) array" of data describing what should appear in the block. We'll discuss that later. Annotations are the Drupal 8 way of providing information that used to be in _info() hooks in Drupal 7: metadata about the classes. We won't discuss them further here, but suffice it to say that they mean that the syntax of a comment becomes important, in the same way as the syntax of your code. First, you probably need to clear cache. This can be done in the admin UI ("Configuration" > "Performance" > "Clear all caches") or using Drush (drush cr). Congratulations! you've just created a custom block.